3 strand Polyester rope has high wear and abrasion resistance with stretch up to 15% making it perfect for mooring lines. It is 30% stronger than polypropylene. 3 Stand Polyester maintains it’s flexibility and suppleness. It also has a high breaking breaking strain. Compass Marine is now delighted to offer bespoke mooring lines. 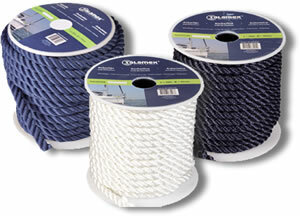 Manufactured in house from top quality, LIROS 3 strand polyester rope they come in white, black, blue and burgundy. Green is no longer available. Available in 8mm, 12mm, 14mm and 16mm rope and made to any size you require. 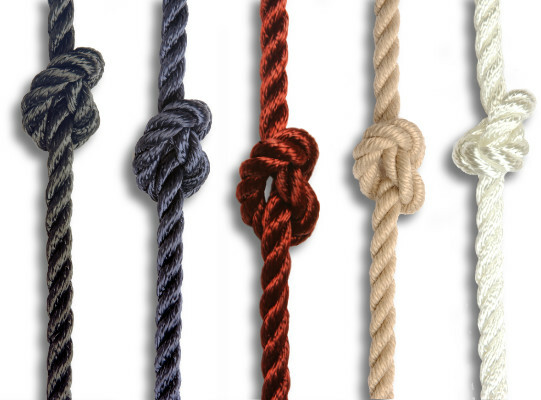 Not sure which size mooring line you require? Click here for our guide. Top quality, 3 strand polyester. Spliced to your requirements for £3.50 per splice. Top quality, 3 strand polyester LIROS rope. Top quality, 3 strand polyester. Spliced to your requirements for £4.50 per splice.